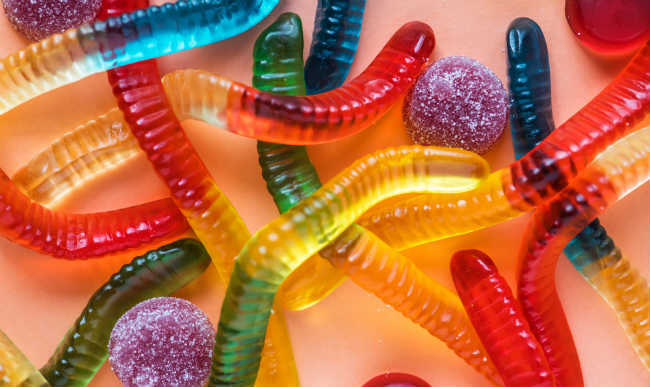 Cannabis-infused gummy snacks are awesome for many reasons – they’re tasty and healthy, they store easily and make dosing a breeze – but traditional gummy recipes call for gelatin which puts them out of the running for our vegan friends. Fortunately, you can make cannabis-infused vegan gummies at home just by switching gelatin out for a different ingredient: agar powder. Don’t want to make your own? Check out our list of the top vegan friendly edible brands. Gelatin is a key ingredient in many gummies, turning liquid fruit juice into a jiggly Jell-O or gummy substance. It comes from animal tissue (bones, cartilage, meaty tissue and other bits of the animal) and is the reason hearty soups tend to coagulate when left in the fridge overnight. When it’s refined, gelatin is odorless and tasteless making it a favorite ingredient for things like marshmallows, non-fat yogurt, candies and most brands of gummy snacks. However, gelatin isn’t the only option for making gummy snacks at home. Though not quite as “bouncy,” another thickening agent, plant-based agar agar, is a great vegan substitute and can be used in almost any recipe calling for gelatin. There you have it, your very own vegan cannabis gummies! Once made, you can store your gummies in an air-tight container for up to three weeks. Remember to clearly label your gummies – especially if they contain THC – and store away from minors. Homemade edibles tend to be tricky to dose because of all the variables that can affect potency (strain type, grow methods, decarboxylation, and so on) but using store-bought tinctures instead of homemade tinctures can help. An easy way to determine the dose of each individual gummy is to compare the milligram amount on the tincture bottle with the amount of tincture added to the recipe. For example, if a tincture bottle contains 15 milliliters of liquid (roughly one tablespoon) and 100 milligrams of cannabinoids, then the whole batch of gummies will also contain 100 milligrams of cannabinoids. To find the dose of each piece, simply divide the number of pieces you have with the amount of cannabinoids you added to your batch (in this case, 100 milligrams) and note the dose on your storage container. Using our example, one batch of gummies containing 15 milliliters of liquid and 100 milligrams of cannabinoids would get you 10 gummies at 10 mg each or 20 gummies at 5 mg each. Living a vegan lifestyle doesn’t have to be hard, especially when you can make your own treats and medicines at home. By substituting agar agar powder for gelatin, you can have homemade vegan cannabis gummies in less than an hour’s time. Enjoy! Do you have any homemade edible tips for our vegan readers? Share them in the comments below!